The Senate voted Monday to end debate and set up an additional vote to conclude the government shutdown after Republicans provided assurances to Democrats that immigration reform and other items of contention would be addressed in the near future. The successful vote came after Senate Majority Leader Mitch McConnell pledged that it was Republicans’ “intention to take up legislation here in the Senate that would address DACA, border security and related issues, as well as disaster relief.” Democrats had attempted to pair such items with an appropriations package. “Let me be clear: This immigration debate will have a level playing field at the outset and an amendment process that’s fair to all sides,” he said. The vote passed by an 81-18 margin with just two Republicans, Sens. Mike Lee, R-Utah, and Rand Paul, R-Ky., voting no. Among the Democrats in opposition were a number of senators rumored to be interested in a 2020 presidential run, including Sens. Kamala Harris, D-Calif., Cory Booker, D-N.J., Elizabeth Warren, D-Mass., and Kirsten Gillibrand, D-N.Y. The next step is for the Senate to vote on a final measure to fund the government through Feb. 8, passage of which would end the shutdown at three days and just one day into the start of the work week. The continuing resolution also includes six years of funding for the Children’s Health Insurance Program. It was not immediately clear how quickly the Senate would hold that vote. Though the vote to end debate was successful, Senate Minority Leader Chuck Schumer continued his criticism of the negotiation process and demonstrated particular frustration with what he described as a lack of bipartisanship from the White House. “The great deal-making president sat on the sidelines,” said Schumer on the Senate floor prior to the vote, explaining that he had not spoken with President Donald Trump since a meeting Friday before the shutdown began. Some moderate and Democratic senators had told ABC News that they hoped McConnell would delay the vote to allow a little more time to work out a broader deal. The cloture vote, which required 60 votes, had already failed several times and Republicans were looking for as many as seven Democrats to join them as of Monday morning. 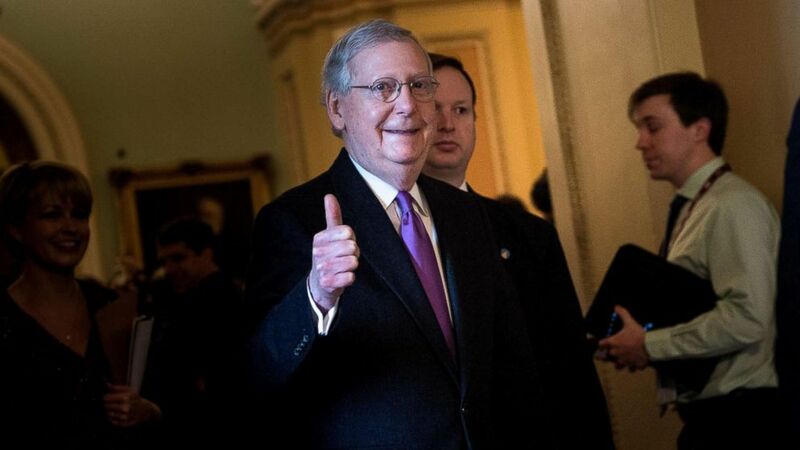 The cloture vote passed despite a group of bipartisan senators emerging from talks earlier in agreement that McConnell needed to clarify his immigration-related promises. Sen. Susan Collins stands with Sen. Lindsey Graham and other fellow Senators after the Senate voted and passed a resolution to reopen the government, at the U.S. Capitol on Jan. 22, 2018 in Washington. “We need a little bit more clarity,” Sen. Gary Peters, D-Mich., said, to the agreement of some Republicans. While Flake characterized McConnell’s effort as a “pretty high profile promise,” and some Democrats said that they felt additionally encouraged Monday, it was far from certain that a solution would come. White House press secretary Sarah Sanders is holding a daily press briefing at 1:30 p.m., when she will likely weigh in on the vote and provide a response from the White House. “The president’s been very clear … on exactly what he wants,” Sanders said on “Good Morning America” today./a>. Senator Tim Kaine waits to speak to a reporter on Capitol Hill after the Senate voted to fund the US government, Jan. 22, 2018 in Washington. “First and foremost we have to reopen our government. We have to fund our government. As soon as that is done, we’re more than happy to negotiate on responsible immigration reform,” she said. The blame game was in full force this weekend, with President Donald Trump tweeting about how the shutdown began with the first anniversary of his inauguration: “Democrats wanted to give me a nice present. #DemocratShutdown,” he wrote. Sen. Lindsey Graham, R-S.C., weighed in that the president is not being well-served by staff in the negotiations over immigration issues that are key to resolving the impasse and reopening the government. ABC News’ David Wright asked Graham if he meant Trump’s senior policy adviser, Stephen Miller, a hardliner on immigration and close adviser on the issue to Trump. “As long as Senator Graham chooses to support legislation that sides with people in this country illegally and unlawfully instead of our own American citizens, we are going nowhere. He’s been an outlier for years,” said White House spokesperson Hogan Gidley. ABC News’ Meridith McGraw, Jordyn Phelps, David Caplan and Meghan Keneally contributed to this report.